It’s been awhile since my last post, obviously, and the reason is a good one. In the days since the beautiful Port Clinton we’ve been out of range of phones and internet in a magnificent part of Central Queensland’s water world. Hopefully I won't bore anyone but what I want to do here is catch up a bit on the last week...show some photos and let you know what's been going on in our world! I'm going to do a series of Cruising Catch-Ups. Here's # 1 - from the lovely Port Clinton to Hexham Island. Friday, June 28, 2013 – We awoke early – 0600 – to prepare for the 8 hour journey from Port Clinton to Hexham Island 43 nautical miles away. The beautiful, expansive Port Clinton - this boat came in late in the night. This is a morning shot as Captain G was murdering the little bug intruders. The night and the stars were spectacular during the evening – as they have been through much of the journey so far – with the Milky Way and our neighbour planets shining like near earth bound beacons instead of being so far away. Nothing like you see in the city with its light pollution. BUT … like any bit of paradise there is always something not quite perfect. When we opened the companion way hatch we were greeted with black clouds of stranded, dying and still moving beasties. Tiny things swarming all over and stuck to the cockpit in every nook and cranny. There were also swarms of the little mites still in the air ready to welcome US - warm blooded creatures - into the morning sun! Captain G fought them off valiantly using the water hose from the front of the boat to the back twice. In the end he relented and shouted to me, “Let’s get the hell out of here!” So we upped the anchor and moved out of the “Port” at dead low tide. Not something we really wanted to do. As we broke out into the ocean the Captain had to take a shower because he felt like they were still crawling on him. 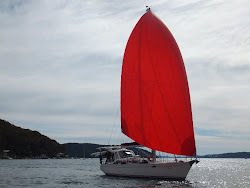 The journey to Hexham Island was uneventful – very little wind so we had to motor the whole way - with the exception of the, slightly obsessed, Captain going around the boat every 10 minutes with spray and a broom trying to get every last tiny bug off his boat. I finally snapped about 5 hours into the trip and said if he waved the broom around the cockpit again I’d throw it overboard! Enough was enough! Lovely - and calm - little Hexham Island and it's lagoon like mooring area....on our approach not all boats are in the photo. Hexham Island and its anchorage was lovely but cramped. We arrived very tired after the long motor to find the small bay already full of 3 large catamarans and another yacht. The island is part of a small group of islands not far – 16 nautical miles – from the larger and more heralded Percy Islands. It’s a good stopping point for boats either on their way to the Percy’s or further toward the Whitsundays.